Give someone a cuddly personalised hot water bottle printed with special photos and memories. The soft, warm 285 gsm fleece cover comes with or without a rubber bottle, so this is ideal if you have a bottle that just needs a little love. Printed onto the front and with four colour options for the back, the custom hot water bottle is a stylish way to snuggle and stay cosy. A comforting custom hot water bottle is a gem of a bedtime treat when the winter chill descends. Printed directly onto the front cover, and with either an ivory, black, blue or pink back, your fleecy cover is a charming gift for anybody who loves to cuddle up and keep warm. Choose to include a 1.8L rubber bottle, or simply design the cover and replace your existing one. The polar fleece is fire rated and water repellent, so it's safe for children to use too. Beautifully soft and gentle to touch, you'll be ushering on the cold weather just so you can use your personalised hot water bottle. Very impressed with Bags Of Love. Ordered a custom hot water bottle cover and was impressed with the ease of the ordering process, the quick production turnaround, speedy delivery and quality of the final product. My daughter was delighted with her unique Christmas gift! Very pleased with the result of a personalised photo water bottle for family. Excellent warm, cosy fabric. Tip: make sure the originating photo is top quality and suitable for use. Like many of our products, your personalised hot water bottle covers come with a quantity discount, so get one for all the family today and save money. Our water bottles comply with British safety standards BS EN 1970:2006 for hot water bottles. The British standard is in compliance with the ASTM D431-95 (2005) voluntary safety standard in place for hot water bottle production in the USA. In the absence of a published International Standards Organisation (ISO) safety standard, the British Standard for hot water bottles mentioned above is widely accepted and used in Europe, and further abroad, as the leading and most comprehensive benchmark for the product. We use a soft, fire rated polar fleece fabric to make your personalised hot water bottle covers, which is covered with your print, cut to size and hand sewn together. Your design is permanent, thanks to the specialist printing process that fuses the inks deep into the fibres. Everything is handmade to order by our skilled technicians and seamstresses, ensuring a beautiful finish and a bespoke gift that can't be found anywhere else. Order the complete package with a rubber bottle and cover, or simply choose the cover to replace an existing one. Care: Your personalised fleece hot water bottle covers can be machine washed at 30°c. Take care to remove the bottle before washing, and when preparing your hot water bottle, be careful pouring the boiling water. Also, ensure the back pouch flap is closed securely to protect your skin. Our water bottles comply with British safety standards BS EN 1970:2006 for hot water bottles. Please use common sense when using your custom hot water bottles to reduce harm to yourself or others. Your special photos are printed onto the front cover, whilst the back can either be ivory, blue, pink or black. Experiment with the different colours and see which one will complement your design the best. Something to consider is the neck of the hot water bottles with cover, ensuring that the features of your photo are kept within the main body so nothing is accidentally cut out. 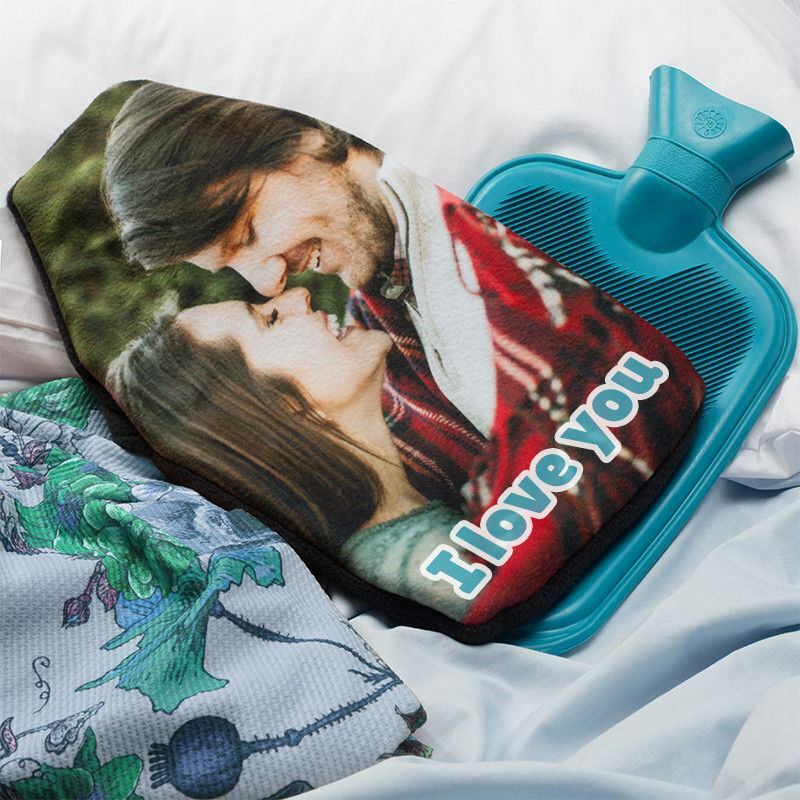 Design a luxury hot water bottle, personalised with a festive photo. This is perfect for winter months when there's a definite chill, and you can dream of a white Christmas whilst cuddling your bottle. If you have a cute picture of your beloved pet in the snow or wearing some tinsel, print it onto your hot water bottle cover and enjoy some love and a hug from your furry friend even when they're not around. From a German Shepherd to a micro pig, any pet will look fantastic on this custom, cuddly hot water bottle covers with pictures on them. Is someone close to you poorly and needs cheering up? This custom made hot water bottle cover, personalised with a Get Well Soon message or something more sentimental, is a lovely gift to help them recover. Your words or photos can bring a smile to their face, and the bottle itself will keep them warm and comfortable whilst they're sick. Great for kids, you can use pictures of their favourite hero, such as iron man, or go for something a little more personal, like their face on a hot water bottle cover, you can add text using different letter fonts, and spell out their name in large print, or add their initials. With next day delivery options available, you can be the designer of these luxury hot water bottle covers. Design online using our specialist interface today. Create a custom hot water bottle for all the family, featuring their photo and nickname. When it comes to mass hot water bottle preparation, it'll be so easy and clear to distribute them to all the children and your partner. They can also include pictures of their hobbies and interests, so it's totally tailored to each individual personality. You could also print a pattern that matches your pyjamas so you can snuggle up in flawless style. Your design printed onto a luxury satin eye mask, with the choice of 6 edging colours. Quilted cushion for comfortable wear. Personalised heat change mugs are great wow gifts. People love to see instant custom heat change mugs. Heat sensitive mug.